Thanks so much to all of you who have signed our petition to California Gov. Jerry Brown asking him to remove as many people as possible from Death Row before he leaves office in January. But if you haven’t yet signed it, here’s a video from DPF President Mike Farrell explaining why he thinks it’s important. The state Constitution allows the governor to exercise mercy by granting clemency and commuting the death sentences of the men and women on Death Row. There is a long history of governors, from both parties and around the country, granting clemency as they leave office. Governor Brown should join this movement: it makes sense, and it’s the right thing to do. 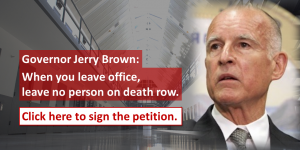 [CLICK HERE] Sign the Petition: Governor Brown Should Leave No one on Death Row When He Leaves Office.